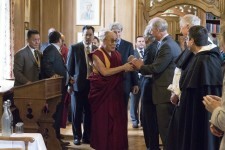 His Holiness the Dalai Lama Meets Fellows and Friends of the DLCC. Photograph by Keiko Ikeuchi. One of the themes to which His Holiness constantly returned throughout his address was the centrality of compassion to Buddhist ethics. To use the language of Thomas Aquinas one could say that compassion is for the Buddhist mind the ‘form of the virtues’ – it is, in other words, that without which the virtues lose their systematic coherence and their directiveness for action. Of course, for St Thomas caritas or charity – which is not only the love shared between human persons but the intimate life of the triune God – takes on the role of the super-eminent or, as Thomas would put it, ‘exemplary’ virtue. Listening to His Holiness’ address I could not help but wonder why in Buddhist ethical thought – especially in its Tibetan form – compassion in particular should stand as the informing master-virtue. An adequate answer to such a question would require a book. Here all I can do is sketch a suggestion that might lead finally to an answer. In order to do so we must first consider what is involved in disposing ourselves to compassionate acts. It may be important to recall what the linguistic infra-structure of the word itself points to – that compassion is a sort of co-suffering or co-inherence in suffering (com-passio). If we understand compassion in such a way we are, I believe, given a clue as to why it can serve as the form of the virtues (though for a reason different from that which Thomas gives for caritas). In acts of compassion there is a self-dispossession by which I am brought out of myself – out of the ego that is my centre – and into the life of another. This displacement of the ego is, so to speak, the dawning of the ethical life for, were one unable get free from the zero-point of the self the question of value would be coterminous with the question of one’s own pleasure or interest (and so ethical considerations would simply dissolve). Thus in compassion one can see, to again quote Aquinas, a potential ‘moving cause’ for the virtues – a ‘root’ from which the rest can be derived. Of course, all of this depends on whether our etymological clue does not lead us to a dead end. And yet it possibly does; certainly, if we consider the Tibetan word most often translated as ‘compassion’ – Snying rje – it does not line up squarely with the meaning at the ground of the English word (indeed, when one considers how the word is employed in Tibetan thought, it in many ways suggests something closer to Aquinas’ Caritas). Needless to say, a book-worth of etymological, semantic and conceptual research would be required to resolve such a problem. Perhaps one of the most amusing moments in the whole address was when His Holiness spoke of his shock at discovering how simplistic modern western theories of psychology were in comparison to the profoundly sophisticated writings of the Ancient Indian philosophers. Hearing all of this reminded me of Elizabeth Anscombe’s short polemical essay ‘Modern Moral Philosophy’ where it is argued that contemporary moral philosophy is ‘conspicuously lacking’ an ‘adequate philosophy of psychology’ and that, being so bereft, the whole enterprise should be ‘laid aside’ until something better is provided. While I have no idea what the prospects are for finding the theory to remedy this lack, His Holiness’ words made me think that perhaps Anscombe’s prognostication was correct – and further, that the philosophy of psychology is an area in which the DLCC could do some important and needed work. If one were to speculate as to why the philosophy of psychology is now so impoverished (presuming, for the moment, that it is) – and again I must repeat this is not the occasion to properly and fully engage such a question – I would be tempted to say that it has something to do with the present tyranny of the materialist conception of mind, a doctrine which, as Anscombe herself saw, is so common as to be assumed without reflection. This is not the place to rehearse the arguments against such a position (there are many) but if, as I believe, it is fatally and irremediably confused, it seems that we will not get out of the psychological ‘kindergarten’ (as His Holiness put it) until we are no longer captivated by the myths of materialism. Of course, the perennial answer to such a question – that there is a good intrinsic to intellectual pursuits – has a certain force, especially for those involved in such pursuits (which is, perhaps, one reason why it carries far less force for those who are not). However, given the amount of resources now required to sustain a vital university this answer will not suffice. Nor will it do merely to say that the university prepares students for the labour market by providing them with the technical skills required for whatever vocation they may choose. An answer to this question will have to be one that acknowledges the intrinsic good of the discipline of scholarship while also demonstrating how the university contributes to the society that supports and surrounds it. In thinking about how to answer this question we may want to consider an image offered by His Holiness – that the University is a ‘nerve centre’ in the body politic. In other words, the university is not only one of the necessary constituents of a properly functioning social body, further, it is one of the institutions that distributes information and knowledge throughout that body. As with the ‘body natural’ (as Hobbes would say), a political body with failing nerve centres would be quick to fall into disease.